Posted on September 27, 2017 at 9:58 am. Are you on the hunt for a book to bring to your next book club meeting? 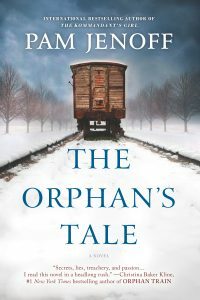 We definitely recommend The Orphan’s Tale–it’s been one of our favorite reads this year! So gather your friends together an get ready to dive into a book that is an engaging, emotional read that you won’t be able to put down. Do help you on your journey, here are some book club questions you can use! Noa and Astrid’s rivalry changes into a close friendship despite significant differences in age and circumstances. How did this evolution happen? What do you think it was that drew them together? Have you ever found yourself in such a close but unlikely friendship? Even in WWII-torn Europe, the circus was still allowed to perform. Did this surprise you? How did the setting impact your reading of the novel? What deeper meaning do you think there is behind the circus burning down in the end? With whom did you identify more closely, Astrid or Noa? Why? What were Noa’s and Astrid’s greatest strengths and their greatest flaws? Were there choices you wish Astrid and/or Noa had made differently throughout the book? What do you think drew Astrid and Peter together so powerfully? Noa and Luc? How do these two relationships differ from one another? Do you think either of these relationships could have lasted a lifetime under different circumstances? How did you feel about the ending? Were you surprised? Satisfied? What will you remember the most about The Orphan’s Tale? Want to know more about The Orphan’s Tale and author Pam Jenoff? Click the links below!